The Jet Chair combines today’s advances in jet propulsion with modern wheelchair design to make a practical, general-purpose sub-sonic everyday chair. The wheelchair finally meets the jet age in this aggressively styled, “weekend warrior” -type chair. Perfectly at home in the Bonneville Salt Flats doing 400mph or cruising to the market, the Jet Chair offers something for everyone. Designed at the famed Lockhood Martin “Skunk Works”, the jet powered wheelchair was initially developed as a high-speed ground-based escape pod for the legendary SR71 Blackbeard. With the close of the cold war and no apparent use for the jet powered wheelchair, Allegro Medical sought the rights to produce the jet chair. The deal crafted with the State Department allows for limited production of the jet powered wheelchair as a recreational use personal transportation device. The stripped down civilian version of the craft is notably missing rocket launchers and heat-seeking missiles. Safety first. Always wear a helmet and fire-retardant underwear when operating a jet powered wheelchair. (Underwear sold separately). Time out. We're kidding! This is NOT a real product. If you thought it was, please see me about a bridge I have for sale. We're merely showing this jazzed up wheelchair to let you know that you CAN make your wheelchair your own. Spiff it up, customize it! Short of adding a jet engine, you can beautify, functify and ratify your chair. 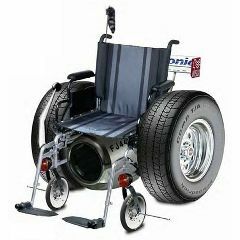 Take a look at all of our amazing wheelchair accessories and start personalizing your chair today! Or, hey, upgrade your whole look with a brand new chair. We have plenty of those in our Wheelchair category. Take a peek. Go ahead and write a Review of the Jet Chair! Oh, and while you're here, you might as well buy something. Anything. That would be great. We appreciate your business. First on my block to own. Durable. Good Value. High Quality. No waiting to GOOOO. Great for quick trips. Vacations. Mountain trips. This is a fantastic investment. I can now get up an hour later to get to work. I don't live far from an airport, so fuel is no problem. I mounted my IPOD on it, but even with the ear buds, it's difficult to hear it, so be prepared for some real noise! The neighbors object when I crank it up at 6:30 in the morning, but I'm gone in a flash. I use the freeway HOV lanes because no cop can catch me! The only drawback is having to visit the dentist after each flight/trip. The bugs really stick to one's teeth! Also it's bad on carpeting in the house. High Quality. Good Value. Durable. Comfortable. Powerful Motor. Fast. Long Battery Life. Stable. Easy to Control. Easy to Transport. Expensive. Difficult to Control. Difficult to Transport. Unstable. Low Quality. Short Battery Life. Slow. Weak Motor. Outdoors. Long Trips. Travel. Daily Use. Short Trips. Caregiver. Short Term User. Long Term User. Medical Professional. Elderly. Young. Almost A Vegetable. Better Off Dead. turned into mush mush. entourpanoure. This is the best product on the market these days. All these kids love me now and I have so many friends. I can make it to work and back home in less than 30 seconds. The bad part is the police always try to stop me on the roads, but I am too fast and get away every time. I love how the wind blows through my hair as I ride. This satisfied my midlife crisis and now I am forever happy. Thanks Allegro. High Quality. Good Value. Durable. Comfortable. Powerful Motor. Fast. Long Battery Life. Stable. Easy to Transport. Got me to the corner store fast. Almost A Vegetable. Better Off Dead. turned into mush mush. Today, it got me to the store the day before yesterday. High Quality. Good Value. Durable. Powerful Motor. Fast. Short Battery Life. Unstable. Expensive. Difficult to Control. Outdoors. Travel. Long Trips. Daily Use. I Really like taking this to the drag strips and racing those young folk and seeing them eat my dust. It make me feel young again. It is really useful when running away from the nurses at my retirement center when the try to dress me it makes me want to by another one for my friend Billy Joe. Just make sure if you want to have a good time do what i did and attach some wings to the side and take off at LAX raising American Airlines to there destination. The only down side is that i cant drive on the water. does this come with safety harness?